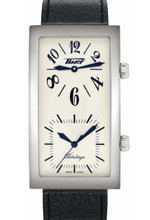 Description : Swiss Made quartz movement (ETA 901.001, 3 jewels) with 58 months battery life. Domed crystal with hard coating. Stainless steel case. Water-resistant to 30m/100 ft.